We’re closing in on the five year anniversary of the most severe market drop in recent history. From the last week of September 2008 through the beginning of October 2008 the Dow shed over 2,000 points – representing an overall market drop of more than 23%. $700B is a lot of money, but it pales in comparison to what’s being spent TODAY. Those were the bad old days. The early innings of a market drop that saw the DOW cut in half. Back in 2008 and early 2009 when the sky was falling the “stupid-big” number (so big it’s stupid) was $700 billion. Back then we were told that a shock and awe bailout would cure the market’s woes… after all it was $700 billion! That’s a lotta dough! Flash forward five years and that $700B was only the tip of the iceberg. The dough has been rolling for five years and counting. In fact, right now we’re about a year into the Fed’s third round of quantitative easing (QE) or as we like to call it QE “Infinity.” Point being when the latest installment of the Feds’ fix started it was meant to be short-lived. After all, spending $85 billion a month can only last so long, right? Here we are nearly 12 months into QE infinity and we’ve spent nearly a trillion dollars! It’s the government’s stealth QE. The one that keeps on taking! Ah and all from the humble beginnings of a $700B bailout. Needless to say, $700B is a lot of money, but it pales in comparison to what’s being spent TODAY. The Fed could be fixing up 42 Colorado towns a month, building anywhere from 17 to 85 power plants a month, cleaning up a gulf spill PLUS a hurricane disaster per month, or cover two years of Exxon’s budget per month. But, alas, the Fed isn’t doing anything “real” by my count. Instead the $85B per month goes towards buying bonds and mortgage-backed securities. The printed cash is flowing into a black abyss. You and I won’t see it, but we’re told it’s single-handedly helping prop up the economy. I’ve got to come clean. I did make one error above. The point is, you can’t combat the Fed’s agenda with rationality. I mistakenly brought forth the idea that Fed spending (if it’s to happen at all) could be used more productively. But that was the wrong logic. That is, you can’t expect the Fed to do something productive with all of the cash it’s printing. Instead that money is quickly being funneled into other government programs and the balance sheet of America’s largest banks. 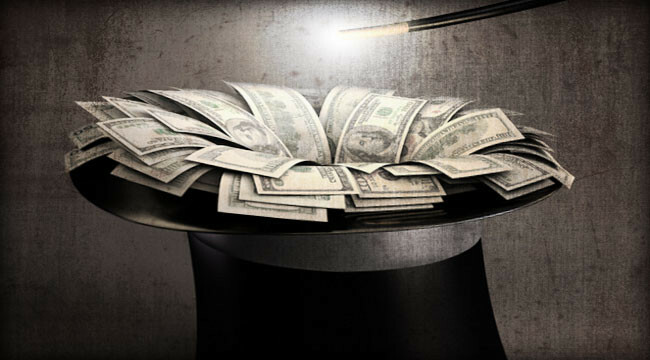 With enough time the Fed’s “magic” will indeed work… But at what price does this “magic” come? Oh, what’s that? The big banks underwrote a zillion bad loans back in 2007? Wow, and they were all subprime borrowers that never had a chance in hell of paying off their debt? Hmmmm. And here we are five years later still trying to cover over those bad bets – keeping interest rates low to spur the housing market, while also funneling billions directly into mortgage-backed securities. With enough time the Fed’s “magic” will indeed work. At some point all of the bad bets that banks made will be a distant memory. Their balance sheets won’t be bleeding red and the housing market will be somewhat back to normal. But at what price does this “magic” come? I’m glad you’re still with me, because here’s the kicker… the price is what any run of the mill contractor would charge – heck it’s the same billing philosophy if you’re getting new drywall installed in your basement: time and money or T&M for short. It’s our T, because here we are five years later and we’re still watching the Fed print billions. And it’s our M. If you’re paying taxes or trying to save your modest wealth, you’re on the hook. The great cover up continues and so does the Fed’s war on savers. In fact, if there’s one takeaway from the last 5 months of Fed Theatre, it’s that you can expect the easing to continue – in some form – well into the future. Luckily there are a few conclusions we can make during this battle of attrition. It’s your job to grow your own wealth. Don’t count on your bank account or bonds! That said, many of our favorite investments have a bright future ahead. I’m talking about energy and mining plays. Momentum is rolling higher for oil and gas shares – we’re truly in the early innings of a massive earth-changing revolution. As U.S. shale plays continue to ramp higher these profitable assets, I say, should hold a strong position in your portfolio. As the Fed prints, producers profit! Momentum isn’t as strong for our friends in the mining sector, but don’t count the golden age over just yet! Last week while slightly tuning in to a CNBC broadcast I heard the talking heads ask a simple question: which price will an ounce of gold fetch first (from its current price) $1,000 or $2,000? It’s a loaded question to be sure. But I don’t much care about the short-term answer. So instead of answering which will hit first, I’d pose another question: will gold hit $2,000 in the long-term? The answer is a resounding YES. So whether that happens in the next year or the next five, holding on to your favorite, well-run mining plays will pay off. P.S. What’s funny, while the Fed continues to print there is one little-known government sector that will continue to profit! Recently a leaked set of government documents all but guarantees that one sector will absolutely soar. And if you’re a Daily Reckoning subscriber, you had a chance to learn just what sector and, more importantly, what companies stand to make huge gains because of these documents. Don’t miss out on this and other incredible opportunities delivered straight to your inbox every day. Sign up for The Daily Reckoning right here. Matt Insley is the managing editor of The Daily Edge and now the co-editor of Outstanding Investments. Matt is the Agora Financial in-house specialist on commodities and natural resources. He holds a degree from the University of Maryland with a double major in Business and Environmental Economics. Although always familiar with the financial markets, his main area of expertise stems from his background in the Agricultural and Natural Resources (AGNR) department. Over the past years he’s stayed well ahead of the curve with forward thinking ideas in both resource stocks and hard commodities. Insley’s commentary has been featured by MarketWatch.